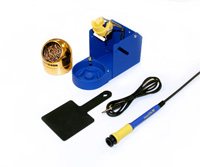 The Hakko FM-2030 Heavy Duty soldering iron kit provides a higher mass tip with double the power of conventional T15 tips. This iron is ideal for soldering difficult-to-solder heavy ground planes and/or high heat sink applications. Kit includes: handpiece, holder with sleep funtion, connecting cable and heat resistant pad. IMPORTANT. PLEASE READ: The FM-2030 can only be attached to the Hakko FM-203 "D" port, and the Hakko FM-206 CH2 or CH3 ports. If you attach the iron to any other port, a grip error or connector error (C-E) will occur.